Ho Ho Ho. We hope that everyone had a very Merry Christmas. 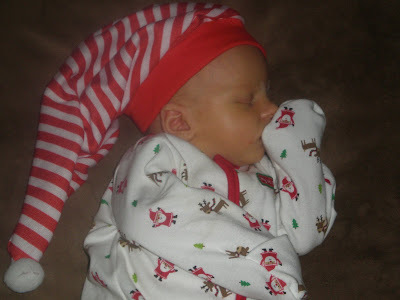 We sure had a special one, since it was Holden's first Christmas. It was also the first Christmas where Griffin "got it". He knew who Santa was (although he called him Tanta). I took Griffin to to see Santa on Christmas Eve, thinking that if nothing else I could get a photo of him with Tanta. To my suprise and delight Griffin not only recognized and greeted him he did not cry and was so excited. He hopped right up on him lap and stared and smiled. When Santa asked him what he wanted for Christmas he patted his head and said "a hat". To Griffin a hat is a helmet. He loves to wear helmets and try to do all of the things that Steve does. 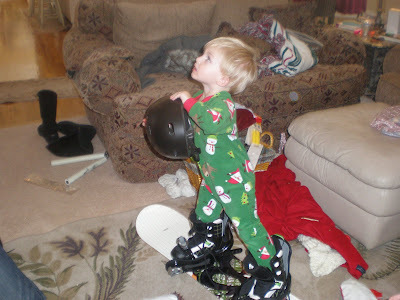 He will go and get into the bindings on Steve snow board (so we got him his own) or the skate board or the paraglider. So i knew that Santa had not finnished Christmas shopping yet and he better make a stop and get Griffy a helmet. He must have done so, because on Christmas morning there was a "hat" waiting for Griffin with a bunch of other things he must have wanted! This pic was from Christmas afternoon between jammie changes, but I love it and could not help snapping a shot of Holden's darling little face! This year was Griffin's 3rd Christmas. On his first Christmas Eve Steve and I started our family tradition of Christmas Jammies. We all get new PJ's that we get to open on Christmas Eve. 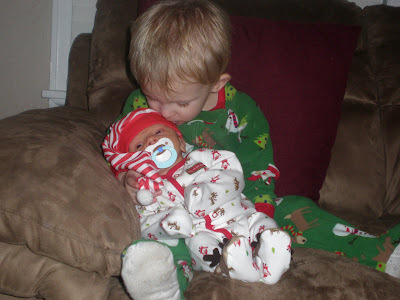 I tried like 10 times to get a picture of my babies in their Christmas Jammies and everytime I snapped, Griffin leaned in to kiss Holden. So I guess THAT is the way the picture is meant to be! As most know, Steve got laid off in Feb of 2009. It was hard and it got harded when I got pregnant after 17 months of trying and then deciding to wait...(of course). Well, in October our prayers were answered and Steve got a call asking him to come back to the oil field to work for Shell drilling! While he was out of work he had gotten his EMT and that must have given him a leg up, since thousands of guys were laid off and 6 were called back! This blessing came at the right time, just a few weeks before the baby was born. He had to choose between being home for the birth of our son and being home for Christams & Thanksgiving. He chose to be here for Holden's birth. So needless to say, we celebrated the birth of our lord and savior, Jesus Christ, without Steve. I will admit that I cried on Christmas morning when we were not togther and few times throughout the day when Griffin got excited or either of the boys did something cute. Luckily I had stayed the night at my Mom's house on Christmas Eve, so at least I was surrounded by family Christmas morning, but it was not the same. So the solution is that when Steve gets home of New Years Eve, we are going to pretend it's Christmas Eve and do it all again. I gave each of the boys 2 of their gifts from us on Christmas so they will still have more presents to open and I am going to cook a prime rib dinner. That way we can still have some family memories and photo that include daddy! I also want to take a minute and express my love for Christ and how greatful I am to God for sending a savior to ransom me. What an amazing blessing Faith is. I am astounded by how much love is in my life because of my relationship with Christ. I am so blessed to have my family, my beautiful-healthy children, a husband whom I love more every minute and can't seem to ever get enough of, and most of all to have a Heavenly Father who loves us all enough to send his son to be born on Christmas day to die for us. I am glad you guys had a Merry Christmas. That stinks that Steve wasn't there on Christmas morning, but there is nothing more important then being there for the birth of your children. I can't wait to see Holden, and Griffin again. Hope to see you in January. Congratulations! 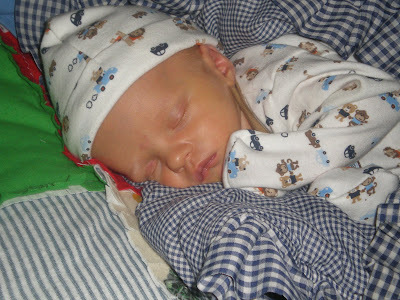 Your new little Holden is so adorable. I am so happy for you guys. I am glad you had such a Merry Christmas. It is always fun when the kids finally "get" Christmas. I hope to see you soon! I feel so bad I have not met Holden!!!!!!!! We need to get together some time!!!!! Especially before Holden is grown up. They grow so fast..... He is adorable! So if Griffin of course.